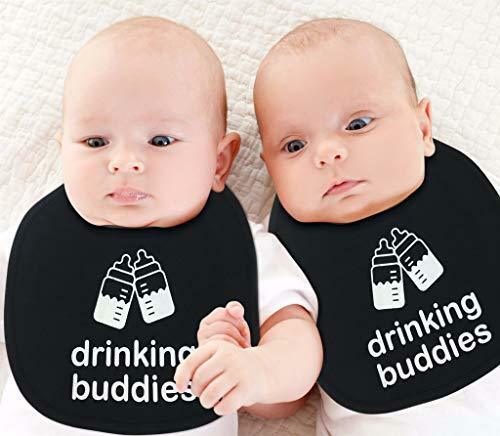 New parents of twins are undoubtedly aware of the struggle of trying to care for the needs of both babies while still living their day to day life. Holding two babies with only two arms and attempting to do household chores is a near impossible task without assistance. An excellent option to ease the struggle of holding twins and still getting things done is using a baby carrier. But which is the best baby carrier for twins? Baby wearing twins allows for caregivers to go about many of their normal daily activities while still keeping the child close to them. Baby carriers allow hands to be free so chores, shopping, and many other activities are made easier. They reduce the need for a ﻿﻿stroller, allowing for less time and struggle getting out of the house. They allow parents or caregivers to feel like an ordinary person as they go about their day. Laura Simeon's shares her 10 reasons to wear babies. Babies crave contact with their parents. The increased time near their parents is incredibly beneficial to development. In a baby carrier, children are exposed to the breathing patterns, heartbeat, and movement methods of the wearer. This can lead to improved physical responses in children. There have also been studies that show that babies who have been consistently carried are happier and less fussy. New mothers commonly struggle to find time to exercise. A twins carrier is basically a super convenient weighted vest, making chores into a weightlifting session. Going for a walk while carrying a baby is more effective exercise than pushing a stroller. Babywearing also encourages confidence and happiness in caregivers, as they are in tune with their children. It can be especially beneficial for mothers with post-partum depression. Babywearing is also a safe method for keeping your baby with you. Products on the market have been tested for safety and, if used correctly, are the most comfortable and convenient way to do tasks like grocery shopping or fun activities like family hikes. Tandem babywearing, or using carrying mechanisms for two children, allows for all the same benefits as single babywearing. It can be done with two babies or with a toddler and a baby. There are quite a few baby carriers on the market that can be used for two babies. Below are summaries of a few of the most recommended products on the market. The TwinGo Original Baby Carrier is a double baby carrier that can also be used by two carriers as a single baby carrier. It features reinforced padded shoulder straps to carry up to 70 pounds. The product can be used for children between 10 and 40 pounds, but requires the heavier child be in the back. The children are required to sit facing inward. When being used as a single carrier the TwinGo attachment carrier can be worn in a hip carrying position. The adjustable shoulder straps allow for a custom fit for adults ranging from 4'11" to 6'5" and the waist adjusts up to 110.” The bag has large pockets to reduce the need for a diaper bag and detachable hoods for both children. It is collapsible, making it easy to travel with. The TwinGo also offers a variety of coordinating accessories to personalize the carrier. These include functional items, such as an infant insert that allows smaller children to be carried with the product, a panel extender that provides additional neck and head support, and shoulder strap teething pads. There are also Mei Tai straps to convert the carrier to an Asian-inspired method of babywearing and interchangeable hoods in adorable custom designs. The Twingaroo is a twin baby carrier wrap and a diaper bag that has received numerous awards. It can be used as a single or double carrier. It can hold two children weighing 10 to 35 pounds each and does not require that the children be similar ages or weights. The larger child should be worn on the back. The design requires that both children face inward. The incorporated diaper bag includes two storage compartments as well as two insulated holders for your baby bottles, but can only be accessed by another person while the product is being worn. It has a wide padded belt for wearer comfort and better support. The waist belt is extendable up to 78 inches, so people of all sizes can comfortably wear the product. There is a front pouch for items that you may need easily in reach such as keys, phone, or wallet. The Twingaroo comes in three colors- black, khaki, and blue patterned. The Twintrexx Twin Baby Carrier is a versatile baby carrier that offers 5 different carrying positions. Two positions are designed for twins and three are for individual babies. This carrier allows for front and back tandem wearing as well as side to side to keep both children in front. Each carrier can hold up to 25 pounds and the carriers can be used separately or together. The carrier is cushioned for added comfort and features external pockets for incorporated storage. It comes with a storage bag to keep it in when not in use. The product come in a burgundy color. It is priced similarly to single baby carrier products. Some reviews say that the carrying positions are difficult to get into and out of at first, but becomes easier with practice. The double baby carrier is not recommended for outward facing use with children younger than four-month-old or babies who have not developed head control. Babies should weigh seven pounds before being carried in this product. The Twintrexx 2 Twin Baby Carrier is an updated version of the Twintrexx Twin Baby Carrier. It features a wider seat base for bigger babies. It has also been updated to include front flaps that open completely, making it easier to get children in and out. There are fewer straps on this product to make it easier to get on and off than the Twintrexx. This product is made in black. This twin carrier is designed specifically to provide comfort to twins and the parent carrying them. The inward-facing ergonomic design is great for the development of your babies’ hips while enabling you to carry the weight of the twins comfortably. The straps are adjustable and allow a custom fit. The waist can be adjusted up to 43 inches. It is made with high-quality and 100% cotton exterior to provide comfort for you and your twins. The carrier is guaranteed safe for you and your babies. However, it can only accommodate kids weighing 10-33 lbs. Also, make sure that the babies are faced towards you at all times. It should be washed with care. It can be washed on a delicate cycle in an automatic washing machine. The straps and plastic fittings should not be ironed. 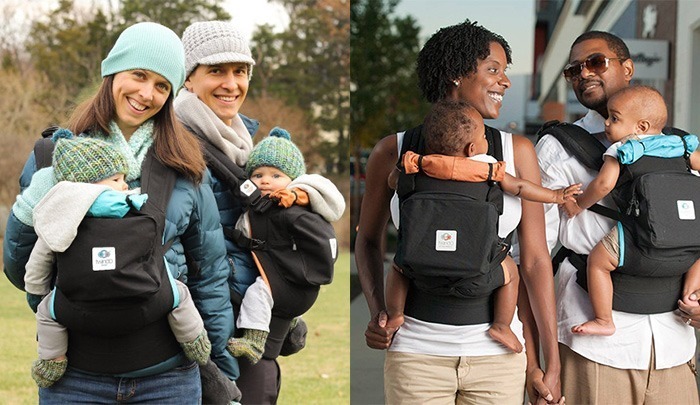 Baby wearing twins is a convenient, healthy, and safe option for mothers. Owning a baby carrier will allow you to finish day to day tasks as well as care for the needs of both babies. Please let us know if you were able to find your best baby carrier for twins. Happy babywearing! Those wrap ones are fine for one baby but not for twins!! The twin carry ways are really tricky and not that secure…I recommend the Weego Twin baby carrier for a really easier and safe and comfy (and more supportive for mom) option. Plus you can still get $10 off on the Weego website with code 12200. I highly recommend it for a twin mom; it’s the only one my twins loved being in!